Company's high productivity manufacturing nanotechnology can efficiently produce ultra-high performance materials for use in microelectronics, aerospace, energy, transportation, oil and gas, and other sectors. AUSTIN, Texas - June 13, 2016 - PRLog -- Frontier NanoSystems, LLC, a privately financed company based in Austin, Texas, has been named a winner of a prestigious 2016 Red Herring Top 100 North America award. Red Herring announced itsTop 100 North America award winners (http://www.redherring.com/events/rhna/2016-top100-winners/) June 8th at its Red Herring North America Forum in Newport Beach, Calif., in recognition of the leading private companies from the region, celebrating these startups' innovations and technologies across their respective industries. "This Top 100 award from Red Herring is a true honor for Frontier NanoSystems," said L. Pierre de Rochemont, the company's Founder and General Manager. "In 2016, selecting the top achievers was extremely difficult," said Alex Vieux, publisher and CEO of Red Herring. "The variety, depth, disruption and traction we saw from the early stage companies to those with significant scale made it one of the toughest vintages to judge. The North America winners are representative of the amazing ecosystem that never ceases to astound, with new and experienced entrepreneurs continuing to push the barriers of innovation. As one of the winners, Frontier NanoSystems should be proud of its accomplishment under such strong competition." 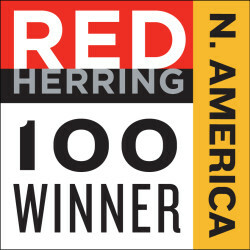 Red Herring Top 100 North America enlists outstanding entrepreneurs and promising companies. It selects the award winners from approximately 1,200 privately financed companies each year in the United States and Canada. Since 1996, Red Herring has kept tabs on these up-and-comers. Red Herring editors were among the first to recognize that companies such as Facebook, Twitter, Google, Yahoo, Skype, Salesforce.com, YouTube, Palo Alto Networks and eBay would change the way we live and work. Red Herring's editorial staff evaluated companies on both quantitative and qualitative criteria, such as financial performance, technological innovation and intellectual property, DNA of the founders, business model, customer footprint and market penetration. This assessment of potential is complemented by a review of the track record and standing of startups relative to their sector peers, allowing Red Herring to see past the "buzz" and make the list a valuable instrument of discovery and advocacy for the most promising new business models in North America. At the heart of Frontier NanoSystems' global IP estate is a new phase of matter the company calls Big Nano. Big Nano is a material that is physically large enough to have economic value, yet, at the same time, still manifests the properties of its nanoparticle equivalent. Despite their enormous promise and early hype, nanotechnologies have disappointed as financial investments. Big Nano circumvents these shortcomings. Frontier NanoSystems has established international claims to Big Nano in the form of a ceramic, an electroceramic, a metal, metallic alloy or superalloy, and a semiconductor. The company's global patent estate now comprises issued claims to product designs and embodiments that promise order of magnitude performance improvements to nearly all microelectronic circuits having large commercial value, from RFID to quantum computing. Red Herring is a global media company which unites the world's best high technology innovators, venture investors and business decision makers in a variety of forums: a leading innovation magazine, an online daily technology news service, technology newsletters and major events for technology leaders around the globe. Red Herring provides an insider's access to the global innovation economy, featuring unparalleled insights on the emerging technologies driving the economy. For more information, visit redherring.com (http://www.redherring.com/). Frontier NanoSystems, LLC, based in Austin, Texas, is commercializing an advanced additive, high productivity manufacturing technology that can efficiently produce ultra-high performance materials, including metals/alloys/superalloys, ceramics/electroceramics and semiconductors at unmatched rates and integrate them into high-value products with applications in the microelectronics, aerospace, energy, transportation, oil and gas, and other industry sectors. Visit frontiernano.com for more information.